They just needed each other. 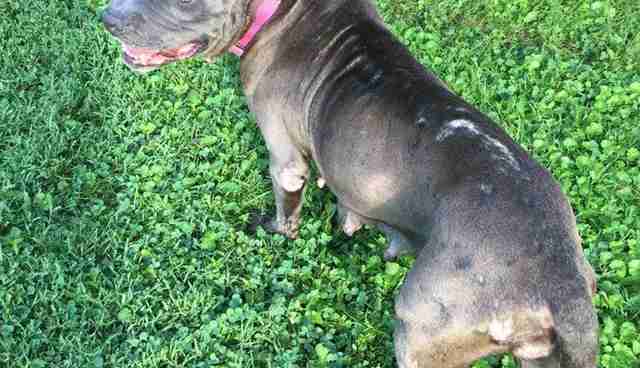 Billie Jean's owner surrendered her to Georgia's DeKalb County Animal Services in horrible condition. 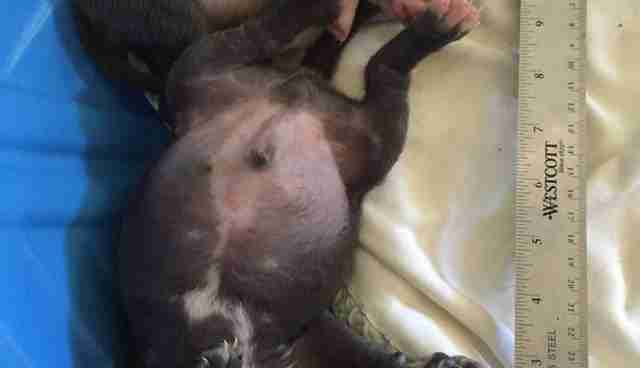 The pit bull had wounds and scars all over her body, and barely any teeth left. 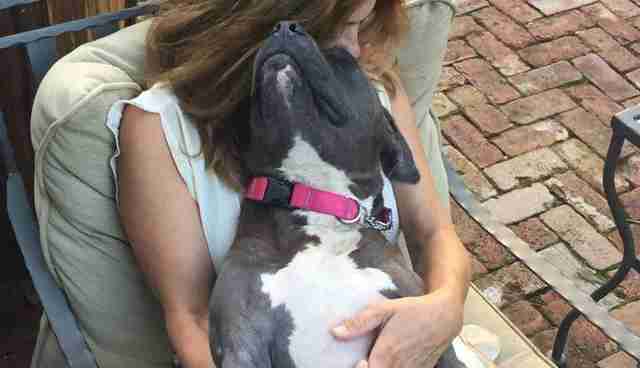 She had kennel cough and heartworms, and on top of all that, Billie Jean was also pregnant. 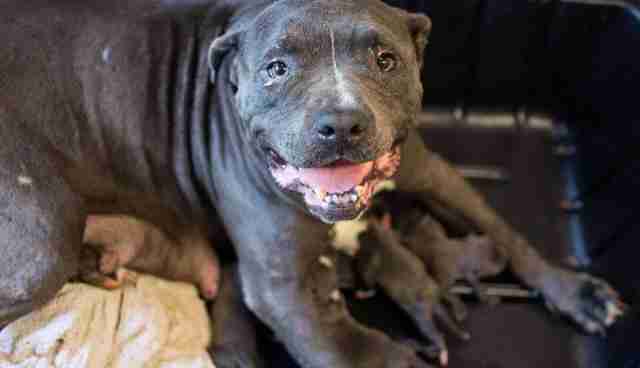 Shortly after arriving at the shelter, Billie Jean gave birth to eight very sickly little puppies. The family desperately needed out of the shelter, and a number of different rescues were made aware of their plight. Rescue Dogs Rock NYC stepped up to take them, and began making plans to have them transported into their care. Unfortunately, Billie Jean came down with pneumonia, and her rescue had to be delayed a few weeks. 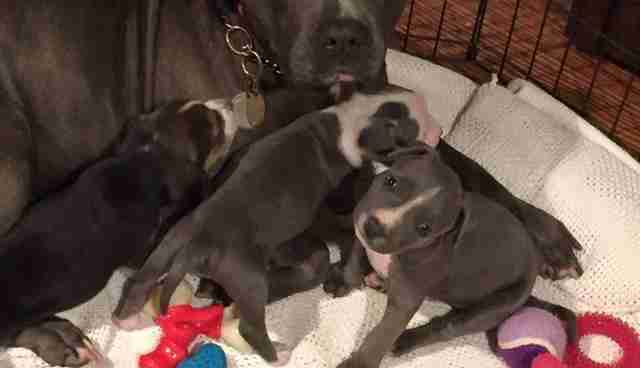 She was separated from her babies during this time, and when the day finally came for her to head to her new foster home, only three of her babies were still alive. 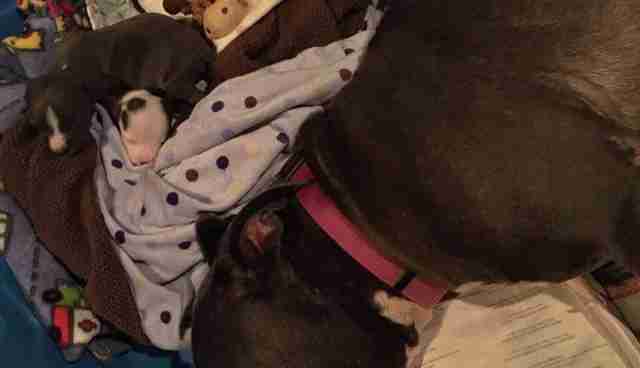 When the little family arrived at their foster home they were still in pretty rough shape. The puppies were only 3 weeks old and still needed constant attention, but Billie Jean was up for the challenge. 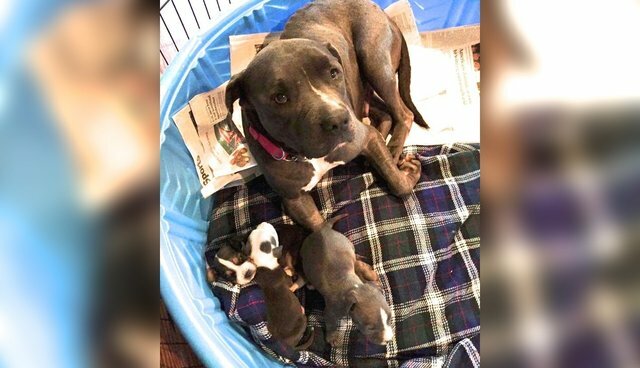 "Billie Jean had not been with her babies in weeks until they arrived in my home," Kristin Murphy Dubnoff, the family's foster mom, told The Dodo. "She took beautiful and loving care of them as soon as they were reunited. She cleaned and laid with them. She was and remains incredibly kind-natured." Despite everything poor Billie Jean had been through, she is the absolute sweetest dog and has nothing but love to give. "Her darling spirit of forgiveness and love shined through from the moment that I met her," Dubnoff said. 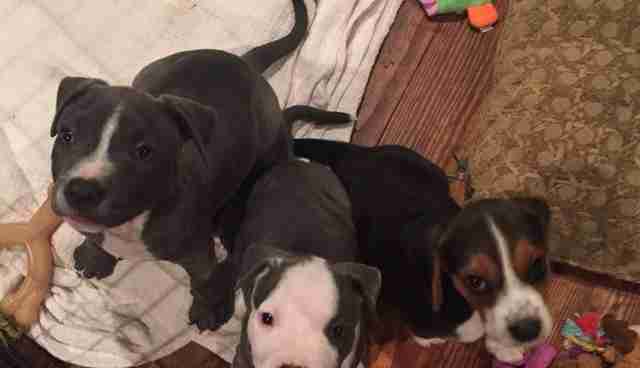 The three puppies were named Kate, Phelps and Simone. Sadly, Kate passed away shortly after arriving at her foster home, leaving Billie Jean with only two puppies left - until Dubnoff got a call from Rescue Dogs Rock. 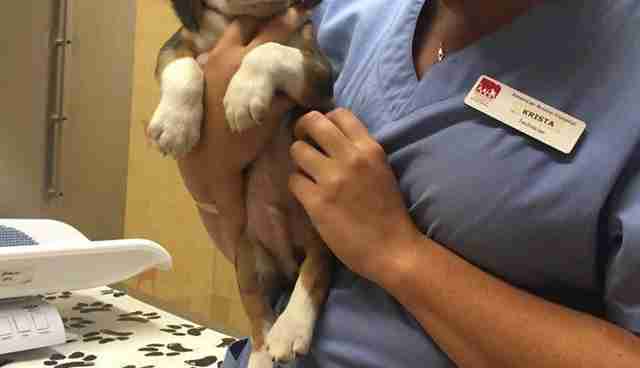 A 2-week-old beagle had been left orphaned and desperately needed someone to care for him. Dubnoff took him in, hoping he would fit in with the pit bull puppies. "Mama Billie Jean took him right in as her own," Dubnoff said. The little beagle puppy became Phelps and Simone's new brother, and the three puppies acted as if they'd been siblings all along. 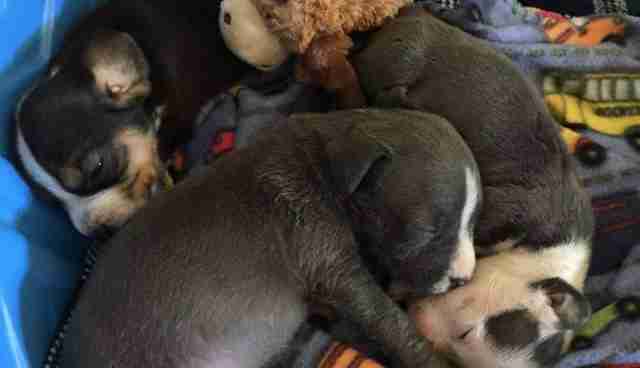 The little beagle puppy filled the space of the sister the pit bull puppies had lost, and the pit bull puppies became the family the beagle so desperately needed. Today, all of the puppies are thriving and have people waiting to adopt them once they're ready. 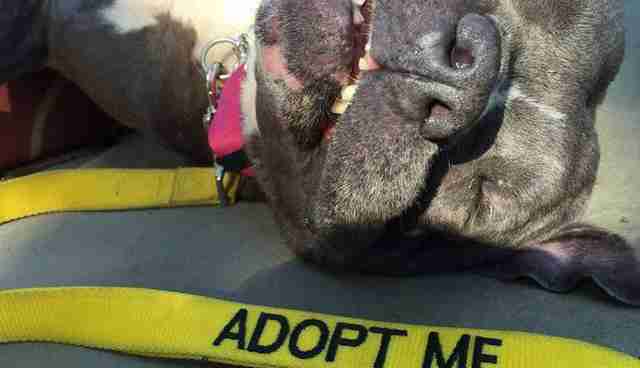 Sweet Billie Jean, however, is still waiting to find her forever family. Billie Jean loves belly rubs, playing with kids and giving and receiving lots of affection. She would make the perfect family dog, and will have unconditional love for whoever takes her in. "She is an absolute angel," Dubnoff said. If you're interested in adopting Billie Jean, you can contact Rescue Dogs Rock NYC for more information.